An all-terrain vehicle, or ATV, also known as a ‘four wheeler’ or ‘quad bike’ is a single seater vehicle, generally used for agriculture, hunting, transportation, or recreational use. Carrying a rifle while riding an ATV can be quite problematic. That’s where ATV gun racks come in. Here we will learn about the aspects you must keep in mind before choosing an ATV gun rack. The article will also address the most common questions related to ATVs and, to wrap things up, we will review the best ATV gun racks on the market, so you don’t have to waste time searching for one. Before you buy an ATV gun rack, you must take certain factors into consideration. Focusing on these factors will ensure that the rack you choose will be useful and effective. Since ATV’s are used off roads and over sparsely populated areas, your ATV gun rack must be durable, easy to mount, and should have ample space. 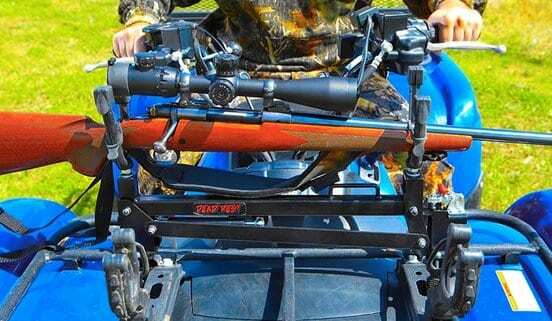 ​Be sure to check out the mounting method of an ATV gun rack. Some racks simply clamp to several positions on the ATV, whereas some must be bolted down by drilling and mounting screws. The former ones are easy to install and remove (if you want to switch ATV’s) but are still prone to dismounting when the ATV moves on very rough terrain. However, the latter ones are more difficult to install but are sturdier and you don’t have to worry about them falling out. 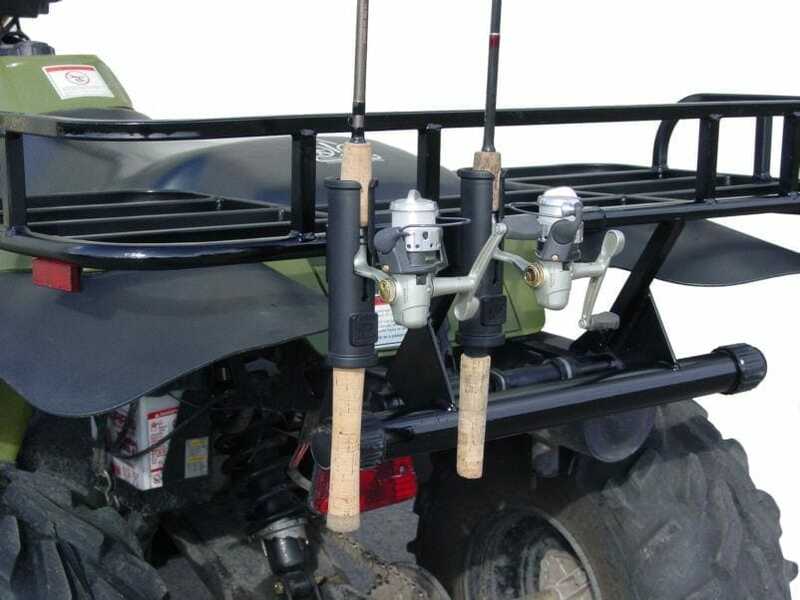 ​Some ATV gun racks are designed to carry only one weapon at a time, such as racks with clamps. However, some racks have a larger storage capacity to let you carry more than one weapon at a time. You must evaluate your needs and the number and type of weapons you plan to carry on your ATV, so the capacity of the rack can accommodate your needs. Some people like to carry shotguns and sniper rifles while hunting, so a larger rack is a better choice for them. ​If you’re riding an ATV, it's pretty obvious that you’ll ride over hills, treks, and all sorts of rocky, bumpy terrain, which means your rack will be subjected to a lot of wiggling, wobbling, and stress. To successfully handle this instability, an ATV rack must be durable, so it can firmly secure your weapons and also stand the test of time and terrain. It is imperative to buy a sturdy, durable rack to protect your weapons, and eventually your life. ​Guns are not the only thing you’ll carry while riding an ATV. You may be also hauling a bow, fishing rod, spear, tripod, shovel, or other equipment. A good ATV rack must be flexible enough to accept guns of different sizes, and for that matter, different items as well. It ensures you don’t run out of storage space when you are carrying a variety of guns or any other equipment. Taking the aforementioned features into consideration, we conducted an extensive amount of research into the market to find the best ATV gun racks. 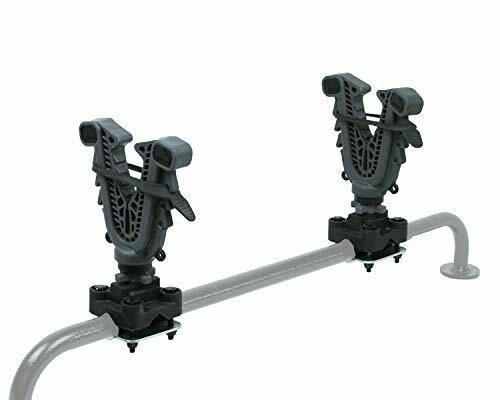 All the racks reviewed here are durable, easy to mount, and aptly priced. 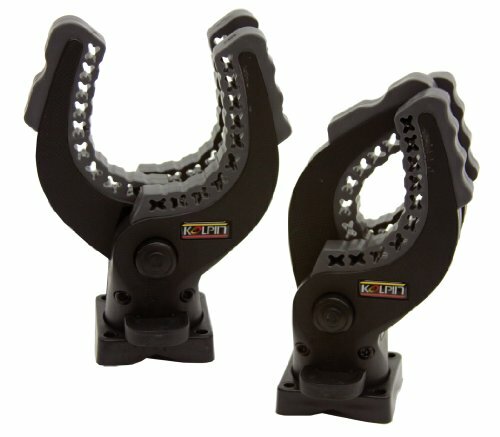 The Kolpin Rhino Grip is a double clamp, designed to be mounted on ATV racks using four screws. The grips also feature straps to hold the firearm/tool firmly. Each of the grips can be used to carry a couple of rifles at a time. Since it is bolted down to the ATV rack, it stays firm and doesn’t wobble. The grip can withstand weights up to 20 pounds and is quite versatile. It can be mounted to ATV’s, pickups, boats, and probably any other vehicle. Additionally, these grips aren’t costly at all. The Kolpin Rhino Grips are a lightweight, compact, versatile, and inexpensive storage option to carry weapons and tools on your ATV. Plus, it can be used on most vehicles, increasing its versatility. The VFG1 V-Grip ATV gun rack is a polymer-based rack which offers a custom fit for your guns and tools. The rack is complemented with rubber snubbers which can be used to store the gun firmly in place, regardless of its size. Each fork also has finger-adjustable knobs to make adjustments while still on the rail. The grip of the rack is strong enough to hold your weapons firmly as you move across rough terrain. Plus, the polymer-based design also protects your weapons from any scratches. The VFG V-1 is a simple and secure storage rack, intended for use with a single weapon. The adjustable knobs make it easier to use. The rack is also well priced, and will not hamper your budget. The Big Sky SBR-2G Sky Bar was primarily designed for UTV’s, but it can also be used with an ATV. All you have to do is simply mount it over the front or rear compartment and you’re good to go. The bar can hold two weapons at a time and all of its clamps are nylon-padded to protect the finish of your weapons and secure them firmly to the frame. The telescopic square bar can be bolted down to the surface so it stays firm and is adjustable so you can carry longer weapons without any problems. This bar was designed to be mounted on the ceiling, so you can also use it inside your car. The Sky Bar’s telescopic square bar lets you carry small, as well as long, rifles. Plus, the padded, nylon strap reinforced clamps are sturdy and safe for your weapons. It can only be used for rifles, as there’s no squeeze mechanism inside the clamps. Good for UTV’s but not great for an ATV, though still a viable option. This one is an extra large version of the first product reviewed on this list. It has been made from molded heavy-duty polymer and has rubber teeth on the inside to grip your weapon firmly. 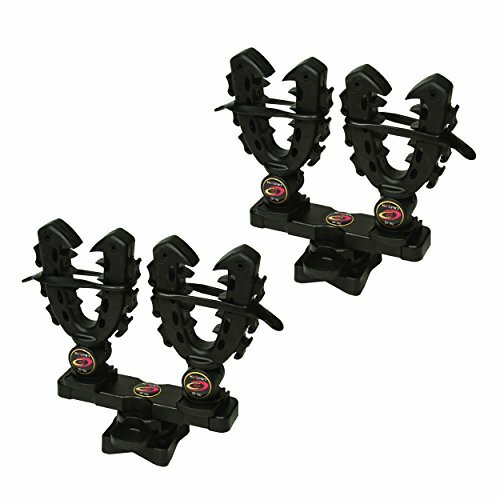 These double clips can be easily mounted over your ATV using the screws included in the package. Additionally, the clamps have a 360-degree rotating and tool-free adjustable design. This gun rack is quite versatile and can accommodate guns, shovels, fishing rods, crossbows, farm tools, etc. It can also accommodate two guns at once, which is also a plus. The Kolpin Rhino XL Grip is good for mid-sized rifles which are not very heavy in weight. The clamp takes some time to install, but other than that, it is a good product. It has been priced at a higher point compared to its counterparts, but considering its quality, that’s not a concern. This product derives its name from its very own design, which resembles a ratchet. The Kolpin Rhino Grip has been made from heavy-duty nylon, with inlaid rubber grip texture, which can be used to carry things like firearms, fishing rods, shovels, farm tools, and other such items. 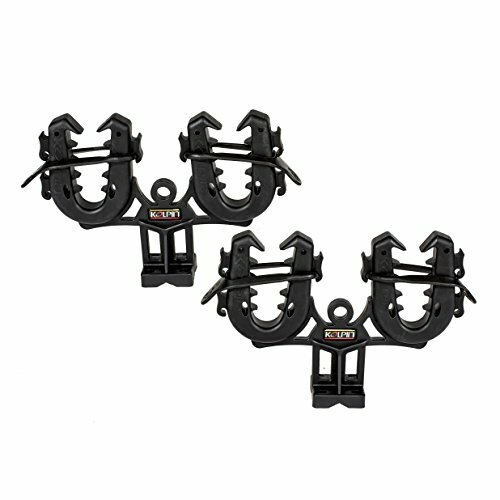 Each of these clamps features a quick release button for easy access, plus they can also be rotated easily for in-field adjustments. These clamps can be mounted to any tubular or square rod using the screws provided in the package. The Kolpin Ratcheting Clamps are a secure option to carry your firearms and tools on an ATV. Its adjustable design and quick release mechanism make it easy to use on the field. However, the clamps can only be used to carry one weapon at a time, which might be a drawback for some. This overhead gun rack can be used with ATVs that have a roof. 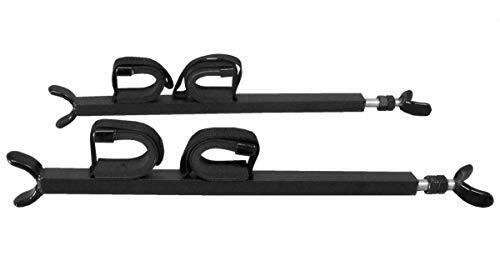 The rack fits front to back roll bar measurements of 23"-28" and keeps your weapons at an arms distance. Not only is this rack easy to access, but it also protects your weapons from rain, dirt, and any harsh weather conditions. The super soft, rubber gun clips hold the weapons firmly and protect them from any scratches. The frame does not need any sort of drilling or bolting for installation. It has been made from aircraft-grade aluminum and weighs only five pounds. The rack can hold two guns at a time. However, it is not good for thinner items like fishing rods and shovels, as they will rattle a lot or may even fall out. This overhead gun rack is a good option to mount on an ATV with a roof. The rack can hold two guns at a time and secures them firmly. The rack itself is easy to install and use. The price is not much of a concern, considering its material, design, and usability. Do I Need an ATV Rack? Why do you need a trunk in your car? Obviously for some extra storage space. The same is true for an ATV. Using a rack gives you some extra storage space to carry essential tools or weapons, which cannot be carried on the shoulder or in a backpack due to an ATV’s design and intended function. Plus, if you are using an ATV, it's pretty obvious that you are outdoors and off-road. So carrying your stuff with you helps a lot. Moreover, your weapon will be more secure in a rack. Where is the Best Place to Mount Gun Rack? It largely depends upon your personal preference. The most common positions to mount an ATV gun rack are the front and rear platforms of the ATV. Some people also prefer to mount them on the sides where they are easy to access. However, the best place to mount the rack seems to be the front of your ATV. This way, you’ll always have your eyes on your weapon, and it will also be easy to access. Are ATV Gun Racks Costly? Well, it depends on the function and design of the gun rack. Inexpensive gun racks are mere clamps which are mounted on the ATV and can hold a single weapon. As you go up the ladder, racks tend to store multiple guns and tools. Plus some racks are personalized to accommodate a specific firearm. You don’t have to shell out an arm and a leg for a good ATV rack. You just have to find the sweet spot between cheap and expensive racks. Luckily, all such options have been outlined in this review. Are ATV Gun Racks Transferable from One Vehicle to Another? Yes. There are several rack designs which can be transferred from one vehicle to another. These racks come in handy when you have to switch between ATVs. Some gun racks are universal and switch easily among different ATVs, whereas some racks have to be drilled down and are difficult to dismount. Are Gun Racks Hard to Install? Not really. Some racks just clamp over the front/rear metal rods on an ATV and take just a couple of minutes to install. Other racks have to be mounted on the ATV by drilling holes and bolting them down. If you have the right tools and skills, installing an ATV gun rack will be as easy as drilling a few holes. An ATV gun rack is a useful, and somewhat essential accessory which helps you carry weapons and tools securely while driving outdoors. A good ATV rack must be easy to mount, durable, and have enough capacity to accommodate your rifles. Such a rack must also be flexible to allow you to carry tools and other weapons as well. If you like to carry weapons with your ATV, you must have an ATV gun rack installed.